For the umpteenth time Mary restlessly rolled her aching frame over on the mat she called her bed. The past two nights her body had tossed and turned almost as much as her weary brain. The thoughts and visions of that horrible day would not stop circling like ugly vultures reviewing the latest kill. “He never did anything wrong and the way they treated Him – the spitting, the mocking, the beatings.” The streaks of crimson trickling down His face when they jammed the circle of thorns on His forehead were forever etched on her memory as were the screams of pain and the loud ring of steel against steel penetrating the hands and feet that did only good. Finally she could stand it no longer and she rose to her feet. “I will go to His tomb and wait for the morning.” She stumbled around in the dark, but finally found her way. The cool air caressed her tear-soaked cheeks and burned her eyes, sensitive from hours of weeping. Nearing the cave that held the body of her Lord, she was startled to see a gaping hole where the stone cover should have been. She pressed her fingers to her aching eyes and peered intently into the gloom to discern what the shadows held. It was true. Though it was still so early, someone had already been here and the stone was gone. With only a moment’s pause she turned and ran to where the disciples Simon Peter and John were just arising from their similarly tortured slumber. 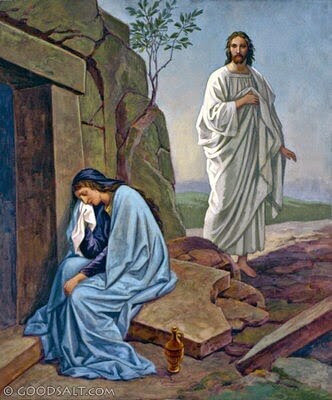 “They have taken away the Lord out of the tomb, and we do not know where they have laid Him,” she gasped. The two men immediately took off towards the graveyard and Mary turned to follow. Upon arriving she saw the look of confusion on their faces. The linen grave clothes along with the folded head cloth were lying on the stone ledge as if the body had somehow mysteriously disappeared. Turning to go she was startled by another man standing outside the entrance. He also asked, “Why are you weeping? Whom are you seeking?” Again she explained the situation and, supposing him to be the gardener, she asked if he knew where the body had gone. The exhausted and distraught woman froze at the gentle stranger’s next word. “Mary.” Immediately she knew this was not a stranger. This was the man Whose body she had been seeking. He was . . . ALIVE! What a blessing to know that Mary’s Savior, Jesus Christ, also knows your name and mine. Why did He endure all the suffering and shame culminating in death? Because He knew that He would break the power of death for all humankind by rising again. It was so His presence could be with all who believe in Him, bringing to His people His peace and joy in the midst of trial. When you are in the middle of a difficult season of life; when all you can do is toss and turn on your bed as you try to sort out the “whys” of life, wait a little longer. Keep listening. In God’s timing, and just when you think you can’t stand the disappointment, you will hear the Savior call your name and it will be worth it all.